NordicTrack C 12.9 Elliptical Review by Industry Experts! The NordicTrack C 12.9 Elliptical Trainer is On Sale! The NordicTrack C 12.9 elliptical trainer offers an impressive number of features at a very reasonable price. The features on the C 12.9 are designed to both provide you with a rewarding cross-training workout and to motivate you to achieve your fitness goals. If you need convincing, write down the list of features we mention below and compare them to other elliptical trainers that are priced below $1,500. In particular, you will not find other brands that offers the innovative iFit Live, nor will they have Android color displays. And the browser not only let’s you see your stats, but when combined with iFit Live allows you to explore the Internet as you exercise. Distractions are good when exercising in place. MID-WEEK SALE ENDS THURSDAY: The NordicTrack C 12.9 is reduced to $1,299 with Free Shipping. No interest financing available. 7″ Smart HD Touchscreen— This full color display lets you access the iFit features with the touch of a finger! Adjustable Tablet Holder – As mentioned, this is the newest feature on the NordicTrack C 12.9 that allows you to enjoy your favorite Netflix shows or blogs while you work out. The holder is adjustable so you can set its angle for the best viewing. iFit Coach Ready— iFit Live is all about motivating yourself to achieve your fitness goals, and maybe go beyond them. It allows for two-way communication between your elliptical trainer and the Internet. This is how it works: You create a profile and define your fitness goals at iFit.com. Let’s say you want to lose 10 lbs. in three months. Through your Wi-Fi connection, iFit will download personalized workouts designed to achieve your desired goals. The workouts are created by fitness trainers like Jillian Michaels. They are progressive in nature and include audio coaching. Depending on your progress the workouts will get more or less intense. After you complete your exercise the results are communicated back to iFit.com so you can constantly track your progress. Studies show those who track their progress are more likely to succeed in achieving their goals. In addition, through Google Maps, you can experience exercising on trails throughout the world. You define a route on Google Maps, and the NordicTrack C 12.9 will simulate the terrain by adjusting the incline or decline. Through the included Android browser display you can visualize your progress through either a satellite, map, street, or earth view on Google Maps. There is also a library of existing routes through famous cityscapes or trails in national parks. We’ve tried iFit Live when we were at the corporate headquarters and ran through our home neighborhood viewing familiar sites. Note: At the time of this posting, this machine comes with a FREE 1-year iFit Membership! A great value. 0-20 Degree Power Adjustable Incline and Decline — Most ellipticals max out at 15 degree incline. At 20 degrees you can get an intense cardio workout. It will provide you with an excellent lower body workout. 32 lb. Flywheel — This is a reasonably heavy flywheel that will contribute to a more natural elliptical motion. You’ll find on cheaper models with lighter flywheels that they tend to have a choppy elliptical stride. Dual Grip Handle Bars — The movable handle bars allow you to grip at various positions. This lets users of different height find the most comfortable position. 35 Built-in Workouts — You get a good variety of exercise challenges. Each workout targets specific muscle groups by changing the incline or decline of your stride. We find that changing workout routines helps to prevent you from getting bored. Resistance and Incline Controls in the Moveable Handle Bars — We really like the fact that you can make adjustments to the resistance or the incline without having to break your stride. Sound System with MP3 Speakers — Although the speakers are smaller than what you would find in their more expensive treadmill, they still crank out some volume with respectable clarity. 350 lb. User Weight Limit — This is very high. In fact, there are only a few commercial ellipticals I would recommend at this weight limit. I would put the limit at 275 lbs. Autobreeze Workout Fan — A decent size fan that does a decent job of cooling off your core. Warranty — You get a lifetime warranty on the frame and 5-year parts and 2-year labor. Respectable coverage for the price. Front Drive vs. Rear Drive Elliptical – Which is Better? 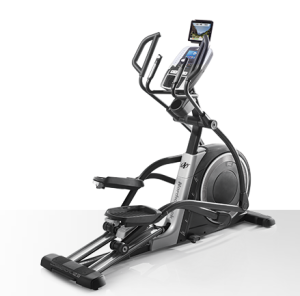 You will notice that NordicTrack offers both front and rear drive ellipticals. Which is better? The rear drive will give you a slightly smoother motion. However, there are three benefits to a front drive elliptical. First, they are more compact, by as much as a foot. Second, they are much easier to mount and dismount. Having to step over the mechanism of a rear drive can be difficult for some users. Finally, the front drive often has the pedals closer together, which places less stress on your hips. Read more here. NordicTrack Commercial 14.9 – Read our full review here. Overall, the C 12.9 has a smooth and natural elliptical stride. One of the most important features that you want on an elliptical trainer. Furthermore, it is a very stable machine. 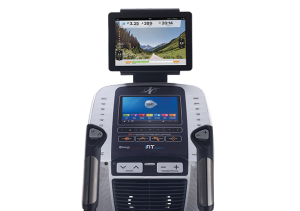 When you factor in the numerous features like Android Browser Display, iFit Live, quality speaker system, adjustable foot pedals, impressive warranty, and a generous selection of programs, you have a very impressive package! The C 12.9 warrants some serious consideration. A similar machine to consider from NordicTrack is the Commercial 14.9. It does not have have the decline feature, but it does have a larger 10″ Smart HD Touchscreen and a stronger 6 year parts / 3 year labor warranty. 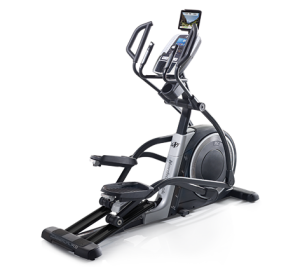 Also, see a full comparison chart of NordicTrack Ellipticals here.